Wynn vs Encore Las Vegas, Which One? At the north end of the action on the Las Vegas strip are two hotel casinos that look very similar – The Wynn and the Encore. 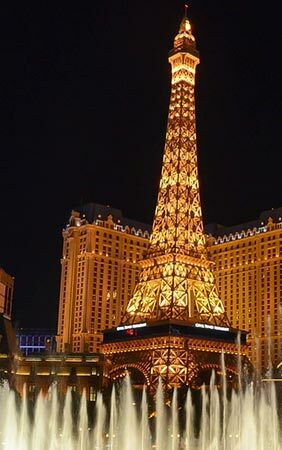 Each is a beautifully massive gold building, and they both contain some of the nicest rooms anywhere on the Strip. The Wynn opened first in 2005, and developer Steve Wynn followed by opening the Encore three years later in 2008. Between the two facilities, the Wynn and Encore hold more Forbes Five-Star awards than any other casino-resort on the planet. To be sure, these are some of the finest hotels around. 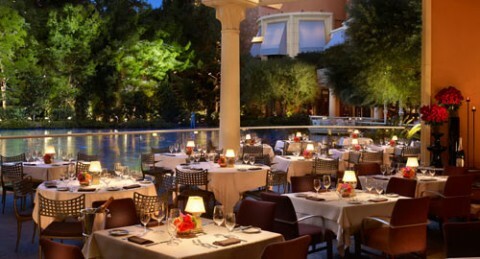 For the visitor to Las Vegas who wants a luxury experience, either the Wynn or Encore would make an excellent choice. However, if you are trying to pick between the two, how do you make that decision. The properties share many traits, but also have some differences. The price of the rooms in both towers tends to remain about the same, so that is not likely to be a determining factor. Let’s walk through a few of the differences between the Wynn and the Encore to help choose the one that is best for your stay. Both the Wynn and Encore offer rooms that are not only among the nicest in Las Vegas – they are among some of the best in the world. You truly won’t go wrong with staying in either facility as you are going to find great beds, nice views, and comfortable amenities. Tower King Suite (640 sq. ft.) – 1 King pillow-top bed, luxury linens, floor to ceiling windows with golf course or strip views, 4K ULTRA HD TV, Bathroom with separate shower and soaking tub, exclusive Wynn Tower Suite entrance. Tower Double Suite (640 sq. ft.) – 2 double pillow-top beds, luxury linens, floor to ceiling windows with golf course or strip views, 4K ULTRA HD TV, Bathroom with separate shower and soaking tub, exclusive Wynn Tower Suite entrance. Executive Suite (933 sq. ft.) – 1 King Pillow-top bed, large living room, work space, dual marble bathrooms, daily breakfast for two at Tableau, private Tower Suite Pool Deck access, luxury linens, floor to ceiling windows with golf course or strip views, 4K ULTRA HD TV, exclusive Wynn Tower Suite entrance, twice daily housekeeping with nightly turndown service. Parlor Suite (1280 sq. ft.) – 1 King pillow-top bed, separate bedroom from common areas, living room, work space with desk, granite wet bar, powder room, whirlpool deep soak tub, walk in closets, daily breakfast for two at Tableau, private Tower Suite Pool Deck access, luxury linens, floor to ceiling windows with golf course or strip views, 4K ULTRA HD TV, exclusive Wynn Tower Suite entrance, twice daily housekeeping with nightly turndown service. Salon Suite (1817 sq. ft.) – 1 King pillow-top bed, private massage room, separate powder room, living, room, bedroom, and dining alcove, granite wet bar, whirlpool deep soak tub, walk in closets, daily breakfast for two at Tableau, private Tower Suite Pool Deck access, luxury linens, floor to ceiling windows with golf course or strip views, 4K ULTRA HD TV, exclusive Wynn Tower Suite entrance, twice daily housekeeping with nightly turndown service. Fairway Villa (2411 sq. ft.- 3224 sq. ft.) – 1 or 2 bedroom villas with King pillow-top beds in each bedroom, panoramic views of Golf Course, private balconies, outdoor dining, 80” 4K ULTRA HD TV, dining room, living room, powder room, complimentary high speed internet, marble bathrooms featuring rain showers and infinity tubs, private drives, Butler service, welcome gift, daily access to pools and spa, priority dining, preferred access to show tickets, expedited entry to nightclubs, limo service. Tower King Suite (745 sq. ft.) – 1 King Pillow-top bed with luxury linens, Floor to ceiling views of the strip, 55” 4K ULTRA HD TV, bathroom with soaking tub, twice daily housekeeping and nightly turn down service, work area, living room, marble bathrooms, daily complimentary coffee and tea and in-room continental breakfast for two or breakfast credit. Access to tower suites pool. Tower Queen Suite (745 sq. ft.) – 2 queen pillow top beds, with luxury linens, Floor to ceiling views of the strip, 55” 4K ULTRA HD TV, bathroom with soaking tub, twice daily housekeeping and nightly turn down service, work area, living room, marble bathrooms, daily complimentary coffee and tea and in-room continental breakfast for two or breakfast credit. Access to tower suites pool. Parlor Suite (1408 sq. ft.) – One King Bed, private massage room, living room with wet bar, powder room, ample workspace, dining area, 2 bathrooms with marble master, air jetted tub, with luxury linens, Floor to ceiling views of the strip, 55” 4K ULTRA HD TV, bathroom with soaking tub, twice daily housekeeping and nightly turn down service, work area, living room, marble bathrooms, daily complimentary coffee and tea and in-room continental breakfast for two or breakfast credit. Access to tower suites pool. 2-Bedroom Apartment (2475 sq. ft.) – King pillow top bed in each bedroom, entry foyer, private massage and powder room, butler pantry, grand living room, dining room, 65” 4K ULTRA HD TV, seating for 14, writing desk, two bathrooms featuring rain showers and whirlpool deep soak tubs and television. 3 bedroom duplex (5829 sq. ft.) – King pillow top beds in each bedroom, twice daily housekeeping with nightly turn down service, butler service, daily cabana, daily spa access, preferred access to shows, priority dining and reservations, expedited entry to nightclubs, limo service, billiards room, massage room, exercise room, 75”4K ULTRA HD TV, two story-cityscape view, powder room, workspace with desk, seating for 16 guests, wet bar with buffet, butler pantry, private bathrooms with rain showers for each bedroom, daily coffee and tea service, complimentary wi-fi. In the case of this head-to-head comparison, the Encore gets the nod for the same reason that the Wynn won the casino round. 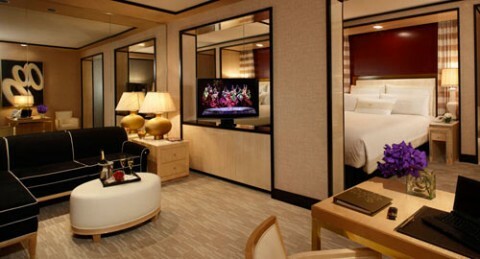 The rooms at the Encore are on average 100 square feet bigger than those at the Wynn. Also, the building is three years newer, so many visitors like the décor and feel of the Encore a little bit better than the Wynn. It is important to remember, however, that this is Las Vegas we are talking about and you aren’t likely to spend too much time in your room. There is a whole world of action waiting along the strip, and there is no sense in sitting in your room for much longer than you need to get some sleep and recharge. Therefore, the size of your room shouldn’t be a major point of decision between these two options. Both offer great rooms, and unless you have a specific reason for needing a bigger room, you won’t go wrong with either one. If you like to spend some time sitting poolside soaking up the sun in Las Vegas, both the Wynn and Encore will satisfy your needs. Each has a great pool that are perfect for taking a quick dip or simply getting some rays. The pools at both facilities fill up fast in the warm summer months, so you will want to get down and grab a lounge chair quickly in the morning. It is important to note that guests of the Encore have access to the Wynn pools, but not the other way around. If you stay at the Encore, you will have more options for pools to use during your stay. 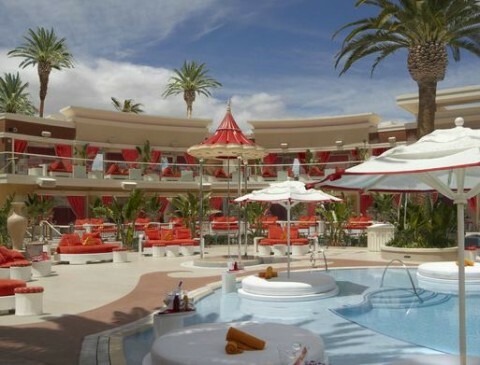 The Encore also features Encore Beach Club, which is a wild party scene that often welcomes some of the best DJ’s in the world. This adult-only pool club is a popular place among the 20-somethings visiting the strip. If you are drawn to that crowd, it is a can’t-miss. Otherwise, you will be equally satisfied with the pool options at the Wynn and the Encore. There isn’t much to differentiate the Wynn and Encore in terms of dining options. Each offers some of the best food on the strip with the two hotels collectively having earned more Forbes Travel Guide 4-star awards than any other independent resort on the continent, and has everything from classic Vegas buffets to fine dining restaurants. Andreas by Chef Joseph Elevado is open for dinner Sunday through Thursday and serves gourmet dishes such as Wagyu Beef and Lobster Roll, five-spice lobster, New York Strip steak and more. The restaurant overlooks the pool of Encore Beach Club where the music can be heard inside the dining area. Sinatra is a tribute to ole’ blue eyes himself, Frank Sinatra. Chef Luke Palladino prepares Italian classics with a modern twist including some of Sinatra’s personal favorite dishes. Open for dinner nightly. Costa Di Mare by Chef Mark LoRusso serves seafood that has earned chef LoRusso the honor of being named best chef in Las Vegas by Southern Nevada Hotel Concierge Association. All dishes are prepared with ingredients fresh from Italy or the Mediterranean. Outdoor seating is available around a lagoon. The Country Club by Chef Rene Lenger is a New American Steak House overlooking the 18th hole at Wynn Golf Course. The restaurant serves breakfast, lunch and brunch on the weekends with a Jazz Brunch on Sundays. Lakeside at Wynn specializes in fresh seafood by Chef David Walzog. Fish are caught and served Ocean to table from Hawaii. Chef also prepares prime aged steak and over delicacies. Lakeside is open for dinner nightly. MIZUMI by Chef Devin Hashimoto features Japanese food with multiple unique dining experiences such as the teppanyaki room, robatayaki bar, sushi and sashimi. The restaurant overlooks a Japanese Garden and Koi pond that features a 90-foot waterfall. Open for dinner nightly. SW Steakhouse offers an American classic steak house in an upscale environment with food by Chef David Walzog. Open nightly for dinner. Tableau is right outside of Wynn Tower Suites where guests will find a bright and elegant space serving American food. There is an outdoor conservatory to dine in and seating overlooking the pool or gardens. Wing Lei is named after the chef herself. The Restaurant serves Chinese foods with western techniques and is decorated lavishly. A private garden with pomegranate trees is available. The slight edge in the food category might go to the Wynn because of its location. The Wynn is located right across the Strip from the Fashion Show Mall, which has many more dining opportunities. There are some restaurants and a food court with fast food and snack options. If you are wanting something a little less fancy (or less expensive) for a quick bite to eat, the walk across the Strip to the Fashion Show Mall is very convenient from the Wynn. However, in terms of food within the Wynn and Encore respectively, you will be eating well regardless of which way you choose. Let’s be honest – if you are Vegas, you are going to gamble at least a little bit. While you don’t need to stay at a hotel to use their casino, it is always nice to have a great casino at the bottom of your elevator ride. With that said, the check mark in this category goes to the Wynn on the strength of having a larger casino floor. Both casinos at the Wynn and Encore are beautifully decorated, clean, and comfortable. However, the Wynn casino is considerably larger and offers a more wide-ranging gaming experience. This isn’t a huge issue because guests of the Encore can always just make the short walk over to the Wynn and enjoy that casino, but it is a consideration when making your reservations. This is the easiest of all the categories to call, because the Encore does not offer a sportsbook. If you are someone that likes to get in some action on a variety of sports games, you will need to head to the Wynn to place your bets. Of course, you don’t need to be staying at the Wynn to wager there, but it will be a little more convenient to cash in your winning tickets when the sportsbook is within your own hotel. If nightclubs are your thing then Wynn/Encore offers some of the top clubs in the World. Encore would have the edge in this category with XS and Surrender Nightclubs, which both host big name EDM DJs . Intrigue Nightclub, at the Wynn, is a captivating 14,000 square foot club with breathtaking waterfalls and innovative special effects such as pyrotechnics and state of the art sound and DJ equipment. Cedric Gervais performs at Intrigue often. The Encore Theater also features several more shows and performances than Wynn Theater which is currently featuring only Le Reve- The Dream by Cirque du Solei. Encore is currently featuring Alabama, john Fogerty, The Moody Blues, Diana Ross, Elvis Costello, and Mel Brooks. If entertainment is what you are coming to Vegas for, book your reservation in a suite at The Encore. So, which one is the winner? That is for you to decide. In general terms, the presence of the Encore Beach Club makes the Encore a little bit more attractive to the younger and more active crowd than the Wynn. The noise from the nightclubs at the Encore can keep the hotel rather loud into the wee hours of the night, so that is something to keep in mind. If you happen to care about the size of your room while in Las Vegas, you want to head in the direction of the Encore. 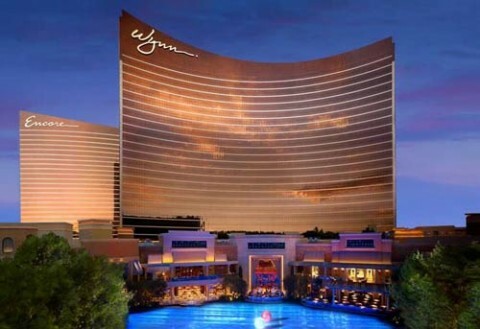 However, the Wynn also has beautiful rooms, and is a little bit closer to other action on the Strip such as the nearby Palazzo and the afore mentioned Fashion Show Mall. In the end, it is going to come down to deciding what your priorities are for your vacation and basing the decision on those factors. The great news is that these are two of the nicest hotels in the world – you truly can’t go wrong. Book now with the one of the Las Vegas hotel promotions.